Atty Mario Apuzzo and CDR Kerchner were guests on the Jeff Kuhner Show on WTNT 570 in Washington DC hosted by Jeff Kuhner on Friday, 30 April 2010, at 1:00 p.m. EST. 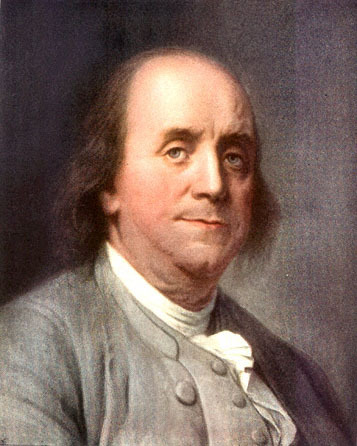 Another founder of our nation and framer of our Constitution, Benjamin Franklin, was also quite familiar and well versed with the writings of Vattel. He had his own personal copy prior to the advent of the Revolution. 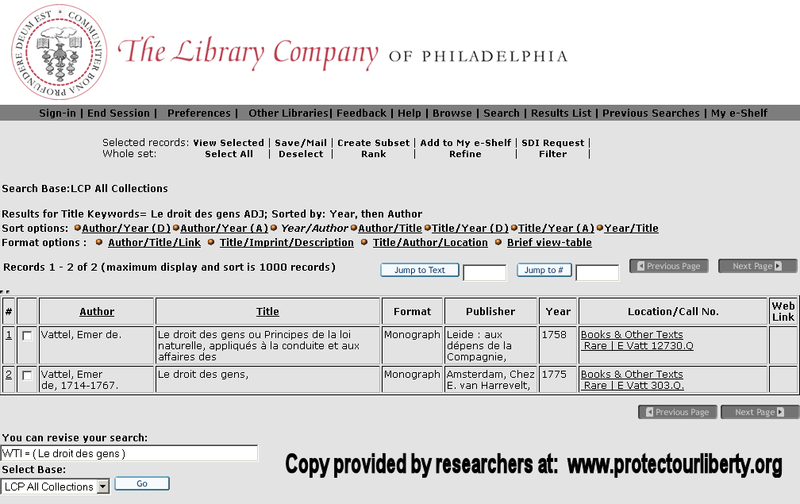 And in 1775 he wrote to Charles Dumas an editor and journalist in the Netherlands and thanked him for sending Franklin 3 copies of the newest edition of Vattel (published in French). Franklin commented to Dumas that his personal copy was in heavy demand by the other delegates to the Continental Congress meeting in 1775. Dumas was the Editor for the newly published 1775 edition of Vattel's Law of Nations (in the original French) in the Netherlands. Franklin and most of the founders were fluent in French which was the diplomatic language of that time. Dumas also made comments in his writings to Franklin about Vattel's enlightened writings and vision for a new form of government for a nation where the people were sovereign and the unique opportunity for its application to the affairs in America in the colonies splitting from Great Britain. The words found in our Declaration of Independence mentioning the "Laws of Nature" and the phrase mentioning unalienable rights such as "life, liberty, and pursuit of happiness" are right out of Volume 1 of Vattel. As are the words of seeking a more perfect union in the Preamble of our Constitution were also inspired by the teachings and writings of Vattel who wrote that government should always be striving to perfect itself to better serve the people. Thus it is quite evident that the founders read and used Vattel extensively. Here is a reprint of the letter from Franklin to Dumas thanking him for sending the books. I am much obliged by the kind present you have made us of your edition of Vattel. It came to us in good season, when the circumstances of a rising state make it necessary frequently to consult the law of nations. 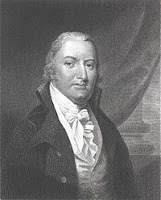 Accordingly that copy, which I kept, (after depositing one in our own public library here, and sending the other to the College of Massachusetts Bay, as you directed,) has been continually in the hands of the members of our Congress, now sitting, who are much pleased with your notes and preface, and have entertained a high and just esteem for their author. Your manuscript "Idee sur le Gouvernement et la Royaute" is also well relished, and may, in time, have its effect. I thank you, likewise, for the other smaller pieces, which accompanied Vattel. "Le court Expose de ce qui s'est passe entre la Cour Britannique et les Colonies," bc. being a very concise and clear statement of facts, will be reprinted here for the use of our new friends in Canada. The translations of the proceedings of our Congress are very acceptable. I send you herewith what of them has been farther published here, together with a few newspapers, containing accounts of some of the successes Providence has favored us with. We are threatened from England with a very powerful force, to come next year against us. (2) We are making all the provision in our power here to oppose that force, and we hope we shall be able to defend ourselves. But, as the events of war are always uncertain, possibly, after another campaign, we may find it necessary to ask the aid of some foreign power. P.P.P.S. Thomas Jefferson also used Vattel's The Law of Nations to write the founding documents. The New York Times on April 21, 2010, did a story entitled, Obama and the ‘Birthers’ in the Latest Poll, by Dalia Sussman and Marina Stefan. http://thecaucus.blogs.nytimes.com/2010/04/21/obama-and-the-birthers-in-the-latest-poll/. The article reported that "[i]n a recent New York Times/CBS News poll, 58 percent said Mr. Obama was born in the United States. That leaves a significant minority who said they thought he was born in another country (20 percent) or said they did not know (23 percent)." Question No. 50 in the poll was: "According to the Constitution, American Presidents must be 'natural born citizens.' Some people say Barack Obama was NOT born in the United States, but was born in another country. Do YOU think Barack Obama was born in the United States, or was he born in another country? Born in US 58 Another country 20 DK/NA 23." Hence, these numbers show that 43 percent do not believe that Obama was born in the United States. The New York Times article is written in such a way as to give the reader the impression that Obama has convincingly proven that he was born in Hawaii and that those who do not believe that Obama was born there are misinformed and poorly educated. What the authors of the article fail to realize or refuse to report is that concerned Americans have very good reasons to doubt that Obama was born in Hawaii. One might wonder why so many Americans are not convinced that Obama was born in Hawaii as he claims. Let us review the evidence pro and con on his place of birth being Hawaii or Kenya. (13) There exists a birth announcement in two local Honolulu newspapers printed in August 1961 (but these announcements alone do not prove that Obama was born in Honolulu. See No. 21 below). (19) Hawaii Health Department has publicly released incomplete and inconclusive information which Obama supporters claim shows that Obama was born in Honolulu. During the 2008 election, Hawaii's Director of Health, Chiyome Fukino, said: "There have been numerous requests for Sen. Barack Hussein Obama's official birth certificate. 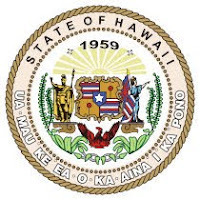 State law (Hawaii Revised Statutes §338-18) prohibits the release of a certified birth certificate to persons who do not have a tangible interest in the vital record. 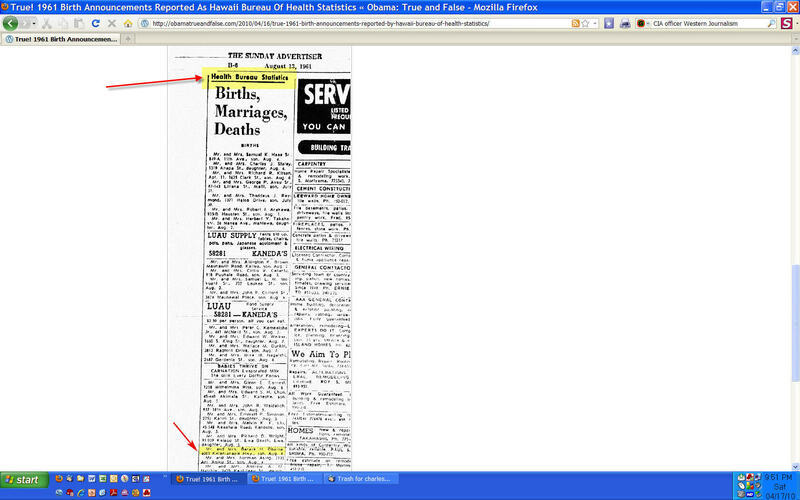 Therefore, I as Director of Health for the State of Hawai'i, along with the Registrar of Vital Statistics who has statutory authority to oversee and maintain these type of vital records, have personally seen and verified that the Hawaii State Department of Health has Sen. Obama's original birth certificate on record in accordance with state policies and procedures. No state official, including Governor Linda Lingle, has ever instructed that this vital record be handled in a manner different from any other vital record in the possession of the State of Hawaii." Months later, in July 2009, she added: "I, Dr. Chiyome Fukino, Director of the Hawaii State Department of Health, have seen the original vital records maintained on file by the Hawaii State Department of Health verifying Barack Hussein Obama was born in Hawaii and is a natural-born American. I have nothing further to add to this statement or my original statement issued in October 2008 over eight months ago." Anyone who is only relying on the fact that Hawaii officials do not say that Obama was born in any place other than Hawaii is missing the point which is what sufficient and credible proof exists that Obama was born in Hawaii. We do not know what evidence Hawaii is relying on to simply say that he was born in Hawaii. If the underlying root "evidence" is fraudulent, then anything Hawaii says is of no value and surely not evidence that Obama was in fact born in Hawaii. In other words, in such a case, Hawaii would be picking fruit from a poisonous tree. (22) The proffered online image of the Certification of Live Birth (COLB) put on the internet states in the lower left corner a date of "Filing" the birth registration. It does not state that the birth registration was "Accepted." Computer generated COLBs obtained for other people registered in Hawaii have the word and date "Accepted" in that field. See these examples compared to Obama's COLB. This implies the birth registration was never finally accepted and that additional information on the birth registration was requested by the state but never received. If the state questioned the evidence in 1961 provided by the family to register the birth as occurring in Hawaii, that is all the more reason now to investigate the birth registration method and statements provided to the Health Department by the family back in 1961. What evidence was missing such that the registration was never "Accepted;"
(29) Another Kenyan Minister on April 14, 2010, made a statement about Obama's origins and says that Obama should repatriate himself to Kenya. "What commitment did they make about compensation and more importantly, the biggest artefact [sic] in the USA today that belongs to this country is one Barrack Obama. How does he intend to repatriate himself or part of the money that is realized from all the royalties that he is attracting across the whole world?" Kenyan Minister Khalwale Asks When Obama Will Repatriate Himself @ Jefferson's Rebels http://jeffersonsrebels.blogspot.com/2010/04/kenyan-minister-khalwale-asks-when.html. None of these factors alone would be sufficient to disprove that Obama was born in Hawaii. But the totality of them raises legitimate doubts which Obama should dispel by providing corroborating evidence supporting his claim that he was born in Hawaii. 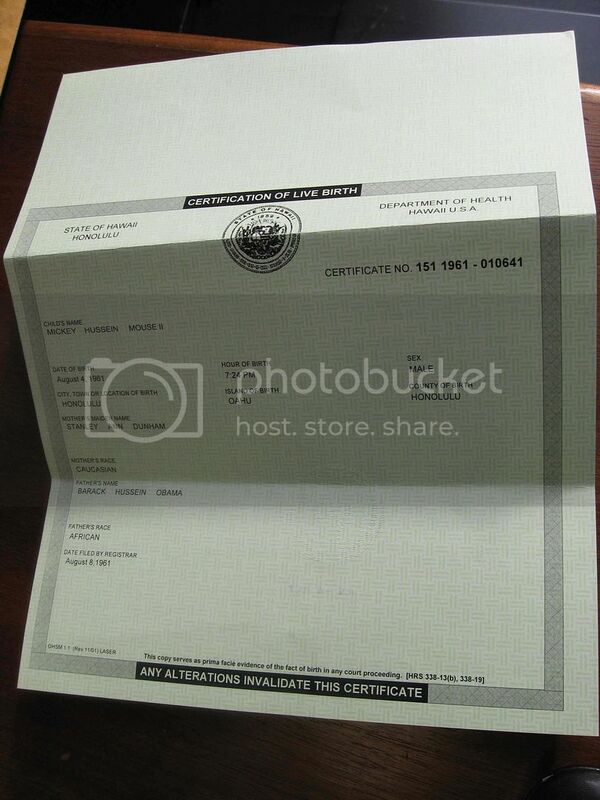 That evidence must be more than just posting in 2008 a computer image of an alleged 2007 COLB which at best is only prima facie evidence that he was born in Hawaii, for it does not contain the name of the birth hospital in Honolulu or of the delivering doctor there or other corroborating evidence. It is Obama who chose to run for President. We cannot imagine that he does not realize that he has no reasonable expectation of privacy as to his place of birth and as to what he has done in his life. Regardless of where Obama was born, he has lost what he probably perceives to be nothing more than a little birth certificate game given that he has disrespected so many Americans who have every right to know who their President is. Obama is supposed to be a constitutional scholar. Maybe he never learned or he forgot that the President works for and answers to the people who under our Constitutional Republic are the sovereigns. Obama’s refusal to provide basic credible information showing where he was born can only leave us thinking what is Obama hiding. A historical account from the times of what the newly sworn in President George Washington was doing with the legal treatise and reference book Law of Nations in New York in 1789. There was a news account recently that President George Washington borrowed the legal reference book "Law of Nations or Principles of Natural Law" and never returned it to the library in New York and now owes a huge past due fine on that book. This new current events story ties into the importance of that book to George Washington and the other founders. 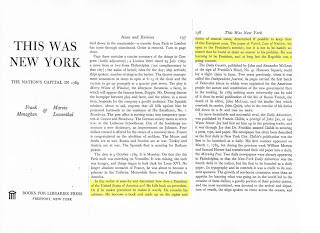 Attached is an image and an the account what the new President was doing with the book in 1789 in New York. 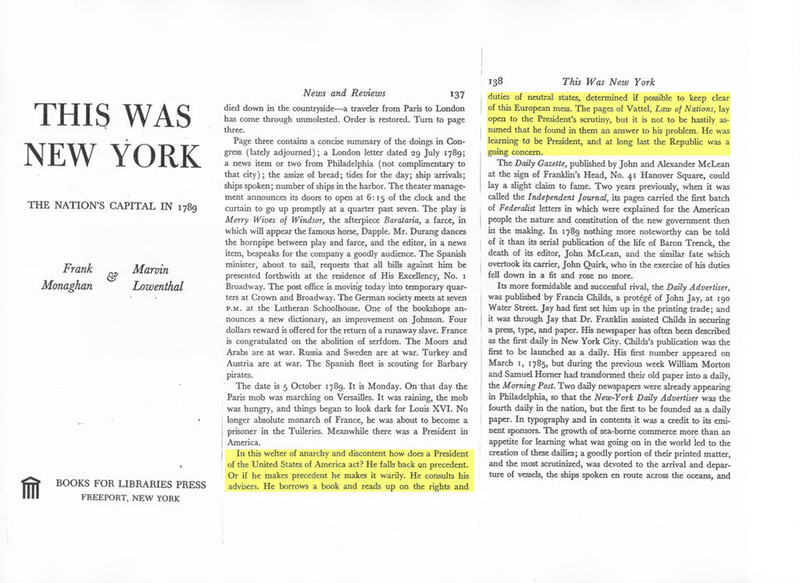 The new President was found consulting that book by visitors to his office in New York in 1789. The Law of Nations by Vattel is a very important legal treatise and was very important to the founding of our nation and writing the Constitution. It was first published in 1758. The Law of Nations is mentioned in our Constitution in Article I, Section 8. The "Law of Nations or Principles of Natural Law" which is its full name was the preeminent legal treatise of the last half of the 1700s and was depended on heavily by the Revolutionary Patriots in the founding of our nation. Benjamin Franklin cited that it was being heavily used during the Constitutional Conventions when he received three new copies of the newest circa 1775 edition from the editor Dumas in Europe. And John Jay the 1st Chief Justice of the U.S. Supreme Court cited it often. This legal book was cited many times by the various U.S. Supreme Courts in the 1800s and much of it became the common law of our land via Supreme Court decisions citing the wisdom conveyed in this book. And it is this legal treatise by Vattel which defines who the "naturel" citizens are, i.e., the "natural born Citizens" of a country, i.e., a person born in the country to two citizen parents of that country. This was the law of nature and Vattel codified it in his book Law of Nations or Principles of Natural Law. This book was the source of the wisdom which prompted John Jay to write to George Washington, presiding officer of the Constitutional Convention in the summer of 1787, and request that the requirement of "natural born Citizenship" be put into the new Constitution as an eligibility standard for the office of the President and commander of the military, for future holders of that office after the original generation past, to minimize any chances of foreign influences on that singular most powerful office in our new nation. The founders and framers in their wisdom anticipated the day would come when a citizen of the world funded by foreign money would attempt to take over America. That day has come. Obama is not a natural born Citizen of the USA. He was born a subject of Great Britain. He is not Article II, Section 1, Clause 5 constitutionally eligible to be the President and Commander in Chief of the military for exactly the reasons John Jay stated to George Washington in the summer of 1787. Obama is a Usurper in the Oval Office and must be removed by We the People. P.P.P.S. Thomas Jefferson also used Vattel to help write the founding documents. Rep. Serrano: I’m glad to hear that you don’t think that there has to be a judge on the Court because I am not a judge. I have never been a judge. Justice Thomas: And you don’t have to be born in the United States. So you never have to ask, answer that question (smiling). Justice Thomas: Yeah (the audience laughing). Rep. Serrano: So, you haven’t answered the one whether I can serve as (Justice Thomas interjecting) President but you answered this one (smiling). Justice Thomas: We’re evading that one (laughter from Justice Thomas and the audience). We are giving you another option (more laughter from Justice Thomas and the audience). Justice Thomas: Thank you, Mr. Chairman. Mrs. Emerson, Ranking Members, then starts to address Justice Thomas as he continues to laugh. The YouTube video may be viewed at http://www.youtube.com/watch?v=O7qEH-tKoXA. A biography on Rep. Serrano may be found at http://serrano.house.gov/Biography.aspx. What does all of this mean in relation to Obama’s eligibility question? What is the message behind all the joking, laughter, and body language that can be viewed on the video? From Justice Thomas’ first mentioning that one does not have to be born in the United States to sit on the U.S. Supreme Court, it appears that Justice Thomas is telling Congress that the Court is angry with Congress for allowing Obama to sit as President even though there is a reasonable doubt as to whether he was born in the United States. Rep. Serrano read the real message of Justice Clarence’s statement and let him know about it, saying “Oh, really.” Rep. Serrano did not like Justice Thomas blaming Congress for the mishandling of the matter so he shoots back at Justice Thomas by telling him the Court failed to answer the Obama eligibility question when it should have but now is answering the question of whether someone who is not born in the United States can sit on the U.S. Supreme Court. From this comment we can conclude that Congress did not believe that it was its job to answer the question of whether Obama is eligible to be President and expected the judicial branch of government to answer that question. This is borne out by the many letters that Congressmen wrote to concerned Americans on the question of what was being done to address the issue of whether Obama was eligible for the Presidency. Justice Thomas then answered that the Court is “evading that one” and giving Congress “another option.” Here we can see that the Court is telling Congress that it avoided addressing the Obama eligibility issue so Congress could resolve it through the political process, giving Congress some other unknown “option” to resolve the crisis. We can only speculate what that other “option” is at this point. Needless to say, it appears that both Congress and the Court are angry at each other for the constitutional crisis that each accuses the other to have caused regarding the Obama eligibility question. The Obama eligibility issue has run its course through the political process. We can reasonably expect Obama to run for a second term. We surely do not want to repeat during Obama’s second run for President what occurred during his first. We cannot reasonably expect to resolve the question of whether Obama was born in Hawaii and the meaning of the “natural born Citizen” clause by way of Americans voting at the polls. This issue is not going away. It is dividing our nation and needs to be decided as soon as possible. There is now no other way to resolve the question of Obama’s eligibility other than through the legal process. As Chief Justice John Marshall so well taught in many of his important U.S. Supreme Court decisions, there is no doubt that the judicial branch of government is well equipped and capable of deciding this critical issue of constitutional law and by doing so will not interfere in the work of the other two branches of government. 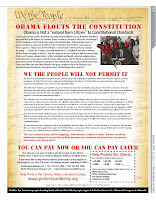 The Kerchner et al v. Obama/Congress et al case which is now pending in the Third Circuit Court of Appeals in Philadelphia with a tentative merits hearing date of June 29, 2010 gives the judicial branch of government the prime opportunity to put this constitutional crisis finally to rest one way or the other. A debate on the adoption of a new Kenyan Constitution took place in the House of the National Assembly of Kenya on Thursday, March 25, 2010. The Official Report of that House, dated Thursday, March 25, 2010, and recorded in the Kenyan government's depository, Hansard-the official source of printed transcripts of parliamentary debates-provides the details of that debate. 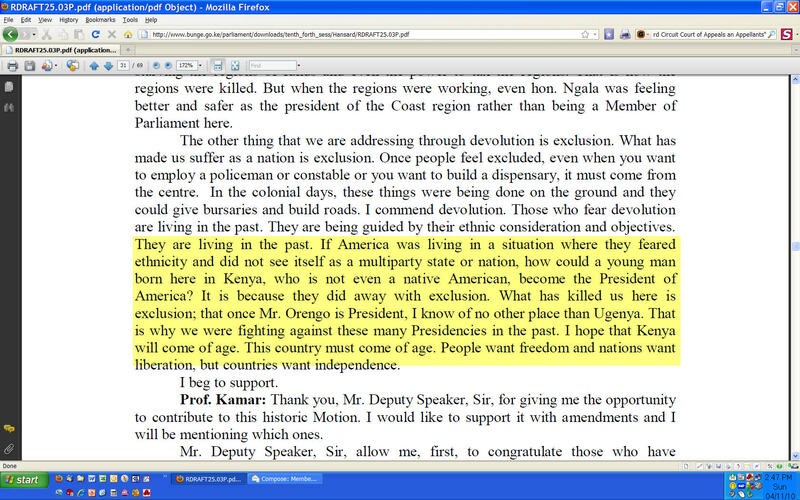 One of the speakers (see pages 29-31) during that debate was The Minister for Lands, Mr. James Orengo. Ironically, he expressed to the Parliament in open debate that "[i]f we do not live by the values and principles contained in this Constitution, all that is contained in this Constitution will be of no significance...." He continued saying that Kenyans must follow the rule of law and especially the Constitution, stating that the "unmaking of Kenya began by disregard and non-compliance of the law. We ended up in a dictatorship that we had to fight for so many years...." He further explained that under the new proposed Constitution, the "Executive authority of the President . . . is derived from the people...."
He then continued to tell the Parliament that Kenya must overcome its problem of elements of its population excluding people from participating in Kenyan life because of their ethnicity or tribal affiliations. He asked that all Kenyans unite, regardless of ethnic or tribal affiliations, stating: "The other thing that we are addressing through devolution is exclusion. What has made us suffer as a nation is exclusion. Once people feel excluded, even when you want to employ a policeman or constable or you want to build a dispensary, it must come from the centre. In the colonial days, these things were being done on the ground and they could give bursaries and build roads. I commend devolution. Those who fear devolution are living in the past. They are being guided by their ethnic consideration and objectives. They are living in the past. If America was living in a situation where they feared ethnicity and did not see itself as a multiparty state or nation, how could a young man born here in Kenya, who is not even a native American, become the President of America? It is because they did away with exclusion. What has killed us here is exclusion; that once Mr. Orengo is President, I know of no other place than Ugenya. That is why we were fighting against these many Presidencies in the past. I hope that Kenya will come of age. This country must come of age. People want freedom and nations want liberation, but countries want independence." There we have it clearly stated by a current Minister of the Kenyan Cabinet that Obama was born in Kenya and is not a "native American." It is unbelievable that a high-ranking member of the Kenyan government would make such a matter-of-fact statement, given the debate that is raging in the United States about whether Obama was born in Hawaii or Kenya. From his statement, it appears that Mr. Orengo believes that the American electorate knew that Obama was born in Kenya and still voted for him to be President. It is also significant that no one in the Kenyan Parliament corrected or challenged Mr. Orengo when he made his statement, given that Obama's place of birth debate must be well-known in Kenya and is important to Obama's legitimacy to be the President of the United States. Kenya would not only be embarrassed but would also be negatively impacted upon if Obama were found not to be the legitimate President of the United States. One would also think that Mr. Orengo would share his knowledge with the American people. I surely hope that the American media will immediately fly to Kenya and personally speak to Mr. Orengo to find out why he believes that Obama was born in Kenya. The full House report was originally found at http://www.bunge.go.ke/parliament/downloads/tenth_forth_sess/Hansard/RDRAFT25.03P.pdf. [Direct viewing scrubbed/disabled on Kenyan server as of 15 Apr 2010. A copy of the Kenyan National Assembly PDF file which was saved and uploaded to SCRIBD.com can still be downloaded from there.] The speech of Mr. Orengo starts at page 29 and ends at page 31. The above quote is found on page 31. Kerchner v Obama Appeal - Atty Apuzzo Files Appellants' Motion for Leave to File Supplemental Appendix. Copy of the Appendix Also Filed. 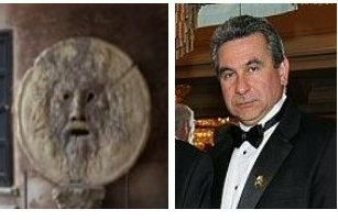 Kerchner et al v Obama & Congress et al Appeal - Atty Mario Apuzzo Filed Electronically on 10 April 2010 to the U.S. 3rd Circuit Court of Appeals an Appellants' Motion for Leave to File a Supplemental Appendix. Along with the motion he also filed a copy of the Supplemental Appendix. You can read the motion and the Supplemental Appendix which I have combined into one file at this link. Our side is ready and rhetorically locked and loaded for the epic struggle. General Quarters has been sounded and the We the People are now awake on this issue and on the move to remove the unconstitutional Usurper from the Oval Office along with his corrupt and socialist backers with their foreign influences, money, and agenda for America to take our nation into a direction that is not American and violates our Constitution, the fundamental law of our land. We are a nation of laws not men. Our hearing in court is coming. 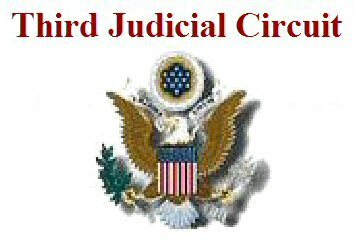 If we don't prevail in the 3rd Circuit Court of Appeals this case will be taken to the U.S. Supreme Court. We the People will not quit. This issue is not going away until Obama's true legal identity is revealed and his constitutional eligibility to be President and Commander-in-Chief of our Military is thoroughly vetted in a court of law on the merits of the charges. The truth and the Constitution will win this fight in the end. We the People will insure that. So help us God. Update: On 26 May 2010 the Court of Appeals denied this motion regarding the filing of the Supplemental Appendix. Oral Arguments for this case in Newark NJ are still tentatively scheduled for 29 June 2010. Atty Mario Apuzzo Files His 'ARGUMENT ACKNOWLEDGMENT' to the U.S. 3rd Circuit Court of Appeals in Preparation for the Hearing and Argument of the Kerchner v Obama & Congress Appeal Scheduled to be Heard on 29 Jun 2010. Atty Mario Apuzzo and CDR Kerchner will be guests on Revolution Radio Show hosted by Dr. Kate on Wednesday, 7 April 2010, at 9:10 p.m. EST. In his 1789 essay, while not using the phrase “natural born Citizen,” Ramsay described the original citizens that existed during the Founding and what it meant to acquire citizenship by birthright after the Founding. The Constitution itself shows that the Framers called the original citizens “Citizens of the United States” and those that followed them “natural born Citizens.” He said concerning the children born after the declaration of independence, “[c]itizenship is the inheritance of the children of those who have taken part in the late revolution; but this is confined exclusively to the children of those who were themselves citizens….” Id. at 6. He added that “citizenship by inheritance belongs to none but the children of those Americans, who, having survived the declaration of independence, acquired that adventitious character in their own right, and transmitted it to their offspring….” Id. at 7. He continued that citizenship “as a natural right, belongs to none but those who have been born of citizens since the 4th of July, 1776….” Id. at 6. Ramsay did not use the clause “natural born Citizen.” Rather, he referred to citizenship as a birthright which he said was a natural right. But there is little doubt that how he defined birthright citizenship meant the same as "natural born Citizen," "native," and "indigenous," all terms that were then used interchangeably. Here we have direct and convincing evidence of how a very influential Founder defined a “natural born citizen.” Noah Webster, 1828, in explaining how an American dictionary of the English language was necessary because American words took on different meanings than the same word in England, placed David Ramsay among great Founders such as “Franklin, Washington, Adams, Jay, Madison, Marshall, Ramsay, Dwight, Smith, Trumbull...” Given his position of influence and especially given that he was a highly respected historian, Ramsay would have had the contacts with other influential Founders and Framers and would have known how they too defined “natural born Citizen.” Ramsay, being of the Founding generation and being intimately involved in the events of the time would have known how the Founders and Framers defined a “natural born Citizen” and he told us that definition was one where the child was born of citizen parents. In giving us this definition, it is clear that Ramsay did not follow the English common law but rather natural law, the law of nations, and Emer de Vattel, who also defined a “natural-born citizen” the same as did Ramsay in his highly acclaimed and influential, The Law of Nations, Or, Principles of the Law of Nature, Applied to the Conduct and Affairs of Nations and Sovereigns, Section 212 (1758 French) (1759 English). We can reasonably assume that the other Founders and Framers would have defined a “natural born Citizen” the same way the Ramsay did, for being a meticulous historian he would have gotten his definition from the general consensus that existed at the time. Ramsay’s dissertation presents valuable evidence of how the Founding generation defined the original citizens and the future generation of citizens which the Framers called “natural born Citizens.” It is valuable because it is evidence of the public meaning of these terms at the time they were framed and ratified. Ramsay’s article and explication are further evidence of the influence that Vattel had on the Founders in how they defined the new national citizenship. This article by Ramsay is one of the most important pieces of evidence recently found (provided to us by an anonymous source) which provides direct evidence on how the Founders and Framers defined a “natural born Citizen” and that there is little doubt that they defined one as a child born to citizen parents. While Ramsay did not require that the child be born in the country, the Framers, with the exception of children born abroad to parents who were serving in the armies of the state or were engaged in other government service (see Vattel, Sec. 217), did as is evidenced by the Naturalization Acts of 1790 and 1795. This time-honored definition of a "natural born Citizen" has been confirmed by subsequent United States Supreme Court and lower court cases such as The Venus, 12 U.S. (8 Cranch) 253, 289 (1814) (Marshall, C.J., concurring and dissenting for other reasons, cites Vattel and provides his definition of natural born citizens); Dred Scott v. Sandford, 60 U.S. 393 (1857) (Justice Daniels concurring took out of Vattel’s definition the reference to “fathers” and “father” and replaced it with “parents” and “person,” respectively); Shanks v. Dupont, 28 U.S. 242, 245 (1830) (same definition without citing Vattel); Slaughter-House Cases, 83 U.S. 36, 21 L.Ed. 394, 16 Wall. 36 (1872) (in explaining the meaning of the Fourteenth Amendment clause, “subject to the jurisdiction thereof,” said that the clause “was intended to exclude from its operation children of ministers, consuls, and citizens or subjects of foreign States born within the United States;” Elk v. Wilkins, 112 U.S. 94 (1884) (“the children of subjects of any foreign government born within the domain of that government, or the children born within the United States, of ambassadors or other public ministers of foreign nations” are not citizens under the Fourteenth Amendment because they are not subject to the jurisdiction of the United States); Minor v. Happersett, 88 U.S. 162, 167-68 (1875) (same definition without citing Vattel); Ex parte Reynolds, 1879, 5 Dill., 394, 402 (same definition and cites Vattel); United States v. Ward, 42 F.320 (C.C.S.D.Cal. 1890) (same definition and cites Vattel); U.S. v. Wong Kim Ark, 169 U.S. 649 (1898) (quoted from the same definition of “natural born Citizen” as did Minor v. Happersett); Rep. John Bingham (in the House on March 9, 1866, in commenting on the Civil Rights Act of 1866 which was the precursor to the Fourteenth Amendment: "[I] find no fault with the introductory clause, which is simply declaratory of what is written in the Constitution, that every human being born within the jurisdiction of the United States of parents not owing allegiance to any foreign sovereignty is, in the language of your Constitution itself, a natural born citizen. . . . ” John A. Bingham, (R-Ohio) US Congressman, March 9, 1866 Cong. Globe, 39th, 1st Sess., 1291 (1866), Sec. 1992 of U.S. Revised Statutes (1866)).